Joy Creek Photo Archive (c) all rights reserved We purchased this Flowering maple many years ago with the simple description "red orange" on the tag. 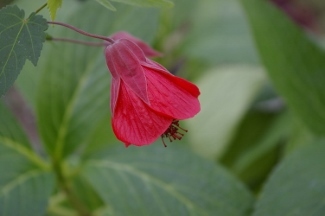 Because of its distinctive red protruding stamens we have taken to calling it Abutilon 'Red Anthers'. The matching color of the pendant, bell-shaped flowers is so appealing and the flowers are produced in such numbers that we decided to release it with this name. The foliage is an attractive mid-green and basically 3-lobed. We grow our Abutilons in containers and protect them during the winter. In milder climates they can easily be grown in the garden. Spring to autumn. 4 ft. x 4 ft.